My new project is making "animal families." For instance, here is the penguin family I made the other day. The baby penguin pattern still needs some work, so I thought I'd make a family of turtles. I've made tons of turtles and know the pattern by heart even though it is not an original pattern to me (I got it off a google search; not sure I could find the link again. ), but in order to make a baby I "miniaturized" the pattern, and I thought I'd share that. Here is the baby turtle. There are eight parts to the turtle: top shell, bottom shell, head, four legs, and a tail. Round 5-sc in each stitch around-24 stitches, fasten off leaving a tail for sewing. That's the top shell. The bottom shell needs to be a little bit smaller than the top shell. Round 2-2sc in each stitch around, 12 stitches total. Round 3-(2sc in the first stitch, sc in the next) around, 18, fasten off leaving a tail for sewing. The bottom shell will fit into the top shell as seen below, but we'll talk about that later. We won't sew it until we have the limbs made. This is a good point to stop and embroider on the eyes. Round 5-sc around-6 stitches, fasten off. Here's the head. You don't really need to leave a yarn tail but you can if you want. Simply ch5, sc in the second stitch from the hook and each stitch down, fasten off. Round 2-5-sc in each stitch, 6 around each row. Now that you have all pieces, sew them together. I started by sewing all the limbs, tail, and head onto the bottom shell as seen below. Then sew the top shell to the bottom shell, sandwiching the other pieces between the two shells. Fasten off. I didn't find it necessary to stuff this piece because it was so small. If you think yours is looking a little flat, stuff any sort of stuffing material into the shell before you sew it closed. So cute!!! I especially LOVE the penguins! Thanks for sharing! So cute! 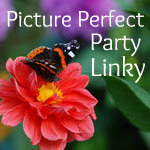 Also, thanks for linking up on my Picture Perfect Party Linky at Amanda's Books and More! how adorable!! I love it!